The taxi was ordered, the table was booked, and the Roman restaurant came with the highest recommendation. He arrived at the restaurant almost two hours later, with a contented beam and a powerful thirst. “I did a bit of work on it,” he said. “Turned a few things round. It feels a bit better now.” In that time, he had rewritten the column, dictated the polished product to London, then awaited the fresh verdict of the sports desk before piling into another taxi, ready to put the restaurant to the test. Jim Lawton was a natural worrier. Even when his brilliance was accepted without challenge, and long after he had taken his place among the finest sportswriters of his generation, he worried that he wasn’t doing himself justice. For a man who could be trenchantly assertive in print, he often appeared curiously unconfident in private. Compliments from his closest colleagues were treated with wary caution: “Did you really think so?” he would ask. “Really?” With some journalists, it would have felt like affectation; with Jim, it was an honest inquiry. Yet the worries never overshadowed the sheer love of his craft. From the moment he joined the Flintshire Leader as a 16-year-old junior reporter in 1959, Jim knew that this was the only thing he ever wanted to do. He moved to the Daily Telegraph subs’ desk in 1963 and later to the Daily Express, where he stayed — with an eight-year interruption for a senior post on the Vancouver Sun — for a total of 27 years. Jim was an Express man to his bones. He loved its style, its swagger and its improbable daily sale of almost four million copies. He loved the paper’s surging self-confidence, fuelled by the talents of some of the most illustrious names in journalism. And he loved the fact that its home was the stunning “Black Lubyanka” which stood solidly on Fleet Street. This street, with its beguiling rogues and its scurrilous rumours, its ceaseless gossip and its seductive glamour became the centre of young Lawton’s world. It was with the Express that Jim covered his first World Cup, in 1966, and travelled to his first Olympics, at Montreal ’76. And it was with the Express that he forged his own style and discovered his distinctive voice. He had a natural gift for the soaring phrase, the lyrical passage which captured the imagination, but with the years he acquired strong opinions. Jim possessed a telling eye for the glib, the phoney and the meretricious, and he flayed them quite fearlessly. But if he had scant pity for his targets, then he adored his sporting friends, most notably Malcolm Allison, the gifted coach who helped create Manchester City’s superb side of the sixties. Indeed, if a sportswriter may be judged by his heroes, then Jim’s admiration for the likes of Lennox Lewis, Tiger Woods, Bobby Charlton and Muhammad Ali told us much about his values. More than any sportswriter of his era, Jim was driven by a desire to write, to fill the page with his thoughts and views. Even when he was working flat out for the Express, he still found time to compose a regular column for his Canadian paper. In later years, he added the Irish Independent group to his repertoire, and all without compromising style or quality. 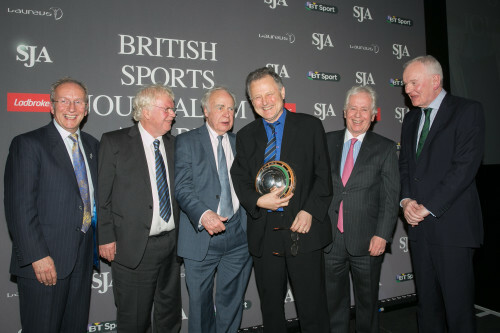 The honours arrived in a glittering stream: SJA Sports Writer of the Year in 1988, SJA Columnist of the Year in 2005, SJA Feature Writer of the Year in 2006, and Sports Journalist of the Year in the British Press Awards in 2010. He relished his prizes, yet he never lost his essential modesty, the tousled head was never likely to be turned. The remarkable quality of his work was vividly revealed in 2000, when he joined the Independent and immediately changed his style and tone to accommodate a different audience. But he never changed his love for the late nights and the laughter, the lively company and fine food, and story after uproarious story with giants like Ian Wooldridge and Hugh McIllvanney. “He (Charlton) moved through midfield as a vision of grace – some said it was a little like seeing a beautiful galleon with full sail – and always there was a hard purpose, a wonderfully acute competitive edge. Pele and Charlton remain devoted. It is that respect that happens between players who understand that having talent is not always enough. There also has to be the heart, the vigour, the supreme football intelligence. In all respects, both men refused to stint themselves, or the game they so hugely enhanced”. That final sentence might have been describing the life and work of James Lawton who died on September 27, aged 75. He was a decent, modest, sensitive man and a greatly gifted journalist. Our deepest sympathies are with his beloved family and his many friends.